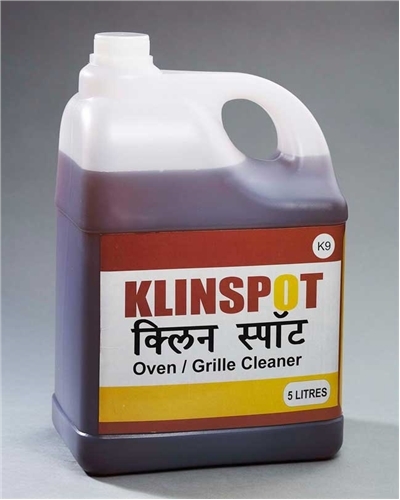 KLINSPOT K9 is a powerful caustic based oven / grille cleaner and degreaser It removes all baked on deposits leaving a clean, grease free surface. 1) For use on ovens, grille and other surfaces for tough grease and carbon deposit removal. Use neat. Apply through a spray bottle, at least 6 inches away from the surface. Wear Gloves. 2) Cold Oven application - Spray evenly over the area to be cleaned. Leave for 10 to 15 minutes and then clean with a scouring pad and rinse with water. Don’t use on aluminum, alloys, paintwork, or galvanized surfaces. Don’t use on surfaces above 80° C.